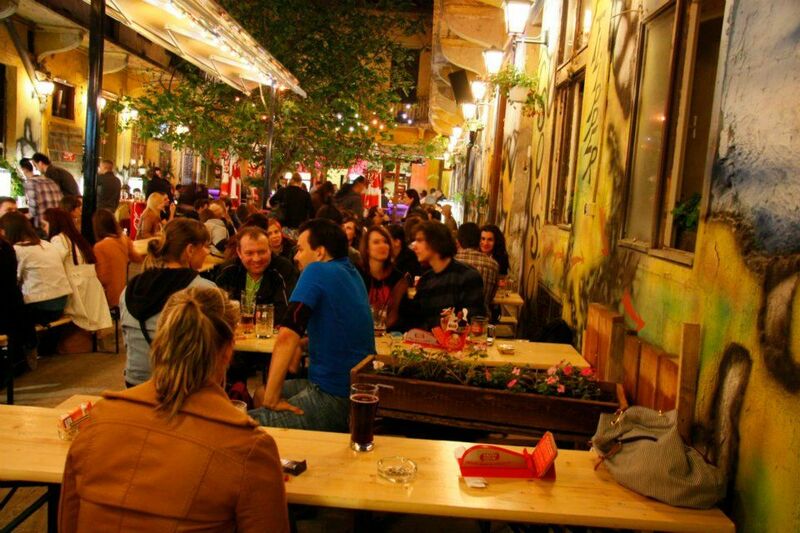 Füge Udvar, translated as Fig Garden is a mediterranean island located in the middle of Klauzál street. Day by day, a huge crowd sitting on colorful benches in the shades of the elder fig tree, at the center of the old, ruined house – is there anything better to do in the summer? But if the tree could talk, it would tell other kinds of stories as well. As the night falls, the volume increases and instead of the chill and the cozy chatting there comes the all-night-long partying, dancing and drinking in the basement room! You can rent this room for private events if you want to celebrate only with your friends. Füge Udvar has table tennis, pool table, table football, even an escape room upstairs if you got bored of too much freedom. Football is also available here, but only in visual form, since you can watch all the important cup matches and championships amongst a huge group of fans, projected on a nice, big screen. If you get hungry you don’t even have to go out, as there’s surprisingly inexpensive, yet freshly baked, delicious pizza. They cover and heat the place in the winter, so you can enjoy your booze and your company in total comfort.